Click the image below to view the full details of the St. Lucie County townhouses and condos market report data as reported by St. Lucie County Realtor for the 4’th Quarter 2018. 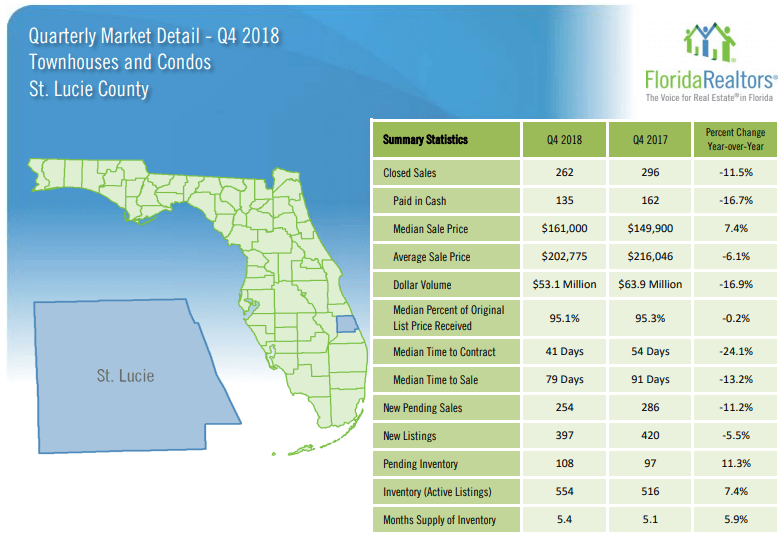 The Saint Lucie Count townhouses and condo real estate market showed weaker sales activity for the last quarter of 2018 when compared to the same period last year. Prices were mixed with the median price rising and the average sales price decreasing. There was a welcome increase in inventory for this quarter. This segment of the real estate market is inching closer to a balanced market. To view the full report, click the image above or this link. Click the image below to view the full details of the St. Lucie County single-family homes market report data as reported by St. Lucie County Realtor for the 4’th Quarter 2018. There was weaker sales activity when compared to the 4’th quarter of 2017. Prices, however, continue to rise. Though, the rate of increases has slowed. There was a welcome increase in inventory for this quarter. Still a strong seller’s market for the St. Lucie County single family homes real estate market. To vie, the full report, click the image above or this link. 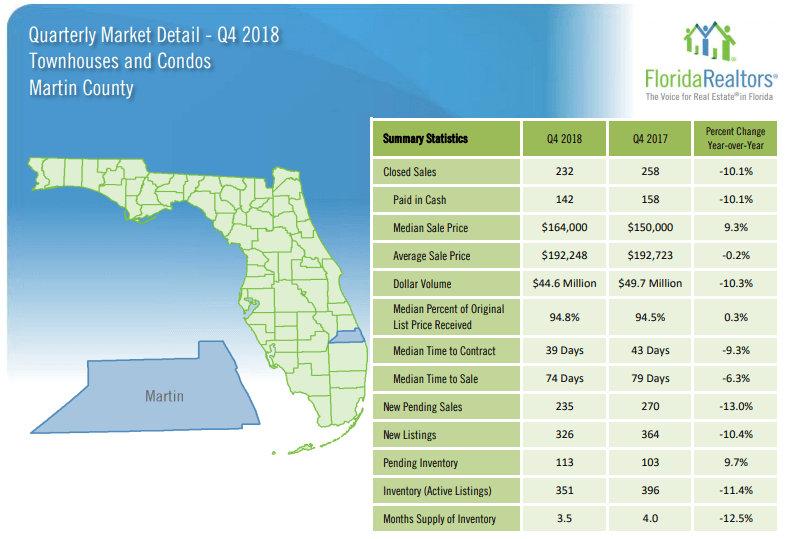 Click the image below to view the full details of the Martin County townhouses and condos market report data as reported by Martin County Realtor for the 4’th Quarter 2018. The Martin County townhouse and condo market had weaker sales activity when compared to the last quarter of 2017. Prices were mixed with the median price rising and the average price having a small decrease. The inventory of available properties is an issue in this market. Continuing in a seller’s market for Martin County townhouses and condos. 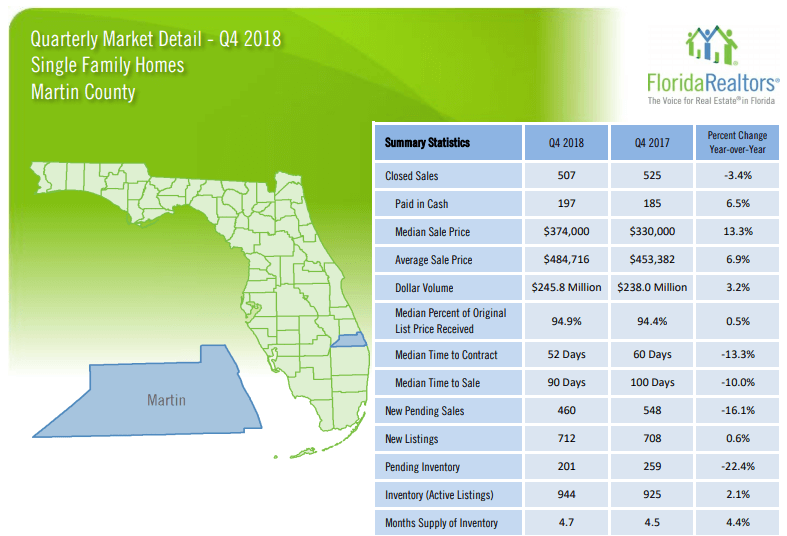 Click the image below to view the full details of the Martin County single-family homes market report data as reported by Martin County Realtor for the 4’th Quarter 2018. The Martin County single family home market showed slower sales volume when compared to the last quarter of 2017. Prices, on the other hand, continued to go up at a fairly rapid pace. Though, it remains an active market. 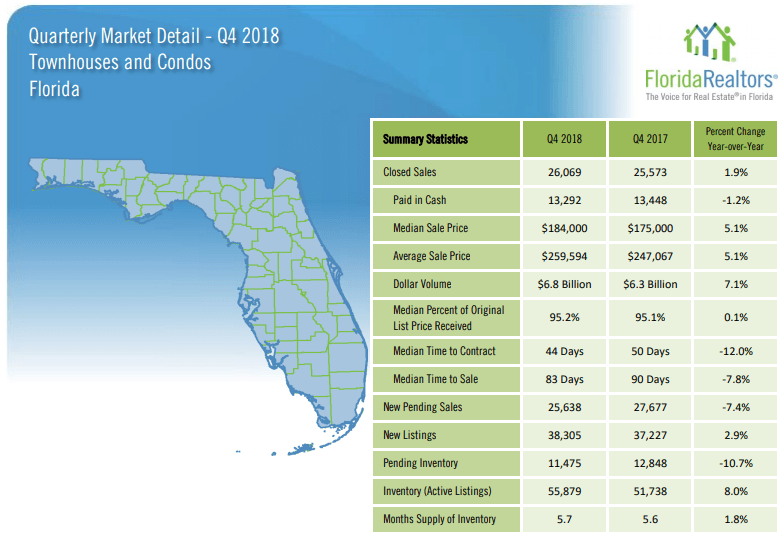 Click the image below to view the full details of the Florida townhouses and condos market report data as reported by Florida Realtor for the 4’th Quarter 2018. Sales numbers continue to improve year to year for the last quarter of 2018 but pending sales were down. Prices continued to rise but at a reduced rate from past quarters. To view the full report, click on the image above or this link.